Hello and welcome to the Studio! Before I go any farther, I would like to wish my dear mom "Happy Birthday!". I love you, Mom, and I hope your day is great! Today's card is one I submitted for a challenge last week at 365 Cards. 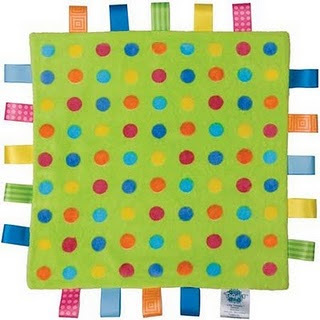 The challenge was inspired by those baby toys that have the ribbon tags along the edge. 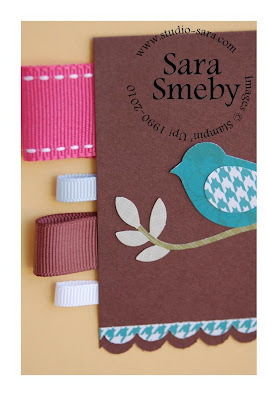 Anyhoo, I simply punched my bird's wing on the flipside of the floral of the Sweet Pea Designer Series Paper so that I'd get the houndstooth design. The houndstooth design is opposite the floral, but one has to punch the bird's wing on the side you want, or else the wing points up when it's flipped over to show the other pattern. Next, I punched the branch using the Old Olive piece (it's the flipside of the striped piece I used in last week's Technique Video). Then I punched it again in the Sahara Sand part of that same piece to get the leaves. I used a little Two Way Glue and the tweezers from my Crafters Tool Kit to put it all together (it did feel like a little neurosurgery, I gotta say, but it's worth it). The ribbons are (in order of appearance) Rose Red 1" Double-Stitched Grosgrain, Bashful Blue 1/4-inch Grosgrain, Chocolate Chip 5/8-inch Grosgrain and Whisper White 1/4-inch Grosgrain. 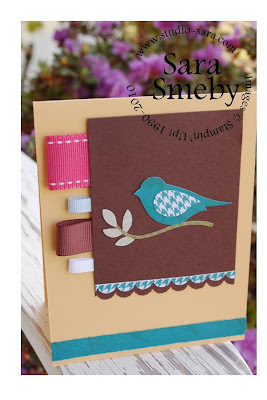 I also used my Scallop Edge Punch to make the little borders at the bottom. Very cute Sara.....I'm like you in that I love that bird punch! So much fun. I love this punch too and I love what you did with it. Such a cute card. What a great idea! I love to use ribbon tabs, but I never thought to use different ribbon for each tab!